This post is part of my streak of posts in the month of May to spread awareness about pediatric stroke. Please consider donating to support Children’s Hemiplegia and Stroke Association, an organization that has helped our family with support and information. 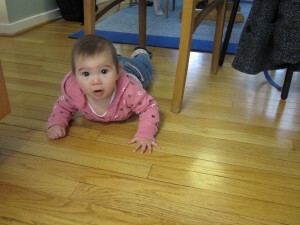 When 8-month-old Mia started to crawl with her right hand fisted, it was unclear when she’d be able to open that hand consistently and at will, unclear that a month before turning 4-years-old, she’d be able to teach herself to swing like a monkey. But, here she is doing that. I think neuroplasticity can explain it, and all the supports that I have put in place for Mia to continue to learn. My own journey with neuroplasticity began more than 20 years ago when I first experienced the Feldenkrais Method® via an Awareness Through Movement® class in La Jolla, California. Moshe Feldenkrais was way ahead of his time, inventing a method to rehabilitate his knee based on his knowledge of physics, judo, and his observations of how babies naturally learn and develop. He soon found applications for all kinds of people of all ages who wanted to improve their functioning. I went to that same class every Thursday at 6 pm for six years all through graduate school and my postdoc. I went initially to help heal a shoulder injury suffered shot putting in high school and exacerbated by playing varsity ice hockey in college. I kept going because the lessons taught me something about myself, about going at a pace that was not my habit. I moved to Ann Arbor, had enough disposable income to seek private Functional Integration® lessons. After a year, I moved to Massachusetts where I still live and once again, I sought out new practitioners. After a few years, I still couldn’t get enough so I entered a professional training program in New York City for four years in the Feldenkrais Method. It’s as if my apprenticeship in the Feldenkrais Method perfectly prepared me to parent Mia with acute mindfulness about her development and the power of neuroplasticity that modern science is now substantiating in concrete ways. Through Children’s Hemiplegia and Stroke Association, I am part of a mailing list for families of “Hemi-Kids” – that is children who have impaired use of one side of their bodies. This week, on the Hemi-Kids list, I read of Karen Pape, a neonatologist who has a very progressive approach towards treating children who had early neurological problems. She has a fascinating Ted talk on her site. Pape’s ideas are completely aligned with those of Moshe Feldenkrais and with how I have been parenting Mia and advocating for her for nearly four years. Habits can get in the way of better functioning and the best way to shake up habits to retrain the brain is to introduce novelty in a challenging situation where some focus is required. In Pape’s Ted talk, she shows a little girl reaching above her head with both arms while standing. She has difficulty doing so fully with her left arm. 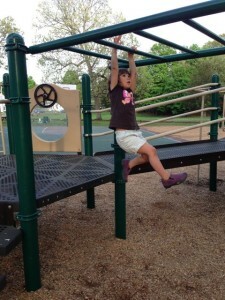 But, when asked to do jumping jacks, the extension is much more complete and natural. When I saw that, I was immediately reminded of Mia’s monkey bar adventures from last Friday when I captured her extending her right arm beautifully to accomplish her own self-defined goal of mastering the monkey bars. This entry was posted in Pediatric Stroke Awareness Month 2013 and tagged Awareness Through Movement, Children's Hemiplegia and Stroke Association, crawl, ear infections, ear tubes, Feldenkrais, fisted, Functional Integration, Hemi-Kids, ice hockey, Karen Pape, Mara, Mia, monkey bars, neuroplasticity, righty, shot put, Zoe on May 14, 2013 by mara.